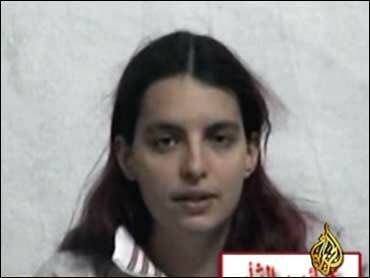 An Arab television channel aired a silent 20-second videotape Tuesday night of hostage American reporter Jill Carroll and said an accompanying message gave the U.S. 72 hours to free female prisoners in Iraq or the journalist would be killed. Al-Jazeera would not tell AP from whom it received the tape, but issued a statement itself calling for Carroll's release. A producer for the network said the tape was received on Tuesday. The tape showed Carroll sitting in front of a white background and speaking, but her voice could not be heard. The 28-year-old freelance reporter for The Christian Science Monitor has not been heard from since she was grabbed Jan. 7 in one of the city's most dangerous neighborhoods. Gunmen ambushed her car and killed her translator shortly after she left the offices of a Sunni Arab politician. Carroll's family released a statement in response to the tape. "Jill is an innocent journalist and we respectfully ask that you please show her mercy and allow her to return home to her mother, sister and family. Jill is a kind person whose love for Iraq and the Iraqi people are evident in her articles. She has been welcomed into the homes of many Iraqis and shown every courtesy. From that experience, she understands the hardships and suffering that the Iraqi people face every day," the statement said. Echoing the reporter's family Tuesday, Christian Science Monitor's editor, Richard C. Bergenheim, said of Carroll's captors, "They have seized an innocent person who is a great admirer of the Iraqi people. She is a professional journalist whose only goal has been to report truthfully about Iraq and to promote understanding." The U.S. military raided a prominent Sunni mosque a day after Carroll was kidnapped, sparking a demonstration by hundreds of worshippers. A U.S. military official said the raid was a necessary immediate response to the kidnapping based on a tip provided by an Iraqi citizen. Insurgents in Iraq have kidnapped more than 240 foreigners and killed at least 39 of them. Carroll, who speaks some Arabic and wore a head covering while moving around Iraq, has been described by her editor as an aggressive reporter but not a reckless one. Despite her language skills, Carroll used an Iraqi translator. The translator was slain by the kidnappers. The driver of their car escaped the attack and is now safe with his family, David Clark Scott, the Monitor's international news editor, said. Police Maj. Falah Mohamadawi said the translator told officers just before he died that the abduction took place when he and Carroll were heading to meet a Sunni Arab political leader in the Adel neighborhood. The predominantly Sunni district is considered one of the toughest in Baghdad. Carroll has had work from Iraq published in the Monitor, AJR, U.S. News & World Report, an Italian news wire and other publications. She has been interviewed often on National Public Radio. Her most recent story was published in Friday's issue of the Monitor, headlined "Violence threatens Iraqi coalition."